Spring is sprung! And a sprung spring coincides with Qing Ming Jie, or Tomb Sweeping Festival. As with every national holiday, the skies were clear of smog, dust, or even a cloud. Why? A few days before the festival weekend, moderate showers doused Beijing with its glorious cleansing powers. Xialian is convinced that such auspicious rain is the work of the government, which has invested heavily in cloud seeding technology. Cloud seeding involves shooting chemicals into existing clouds, concentrating moisture and causing rain. If China does control the weather, I would like to say: Thank you, China. Anticipating nice weather for the holiday weekend, I organized a group outing complete with an activity and potluck lunch. 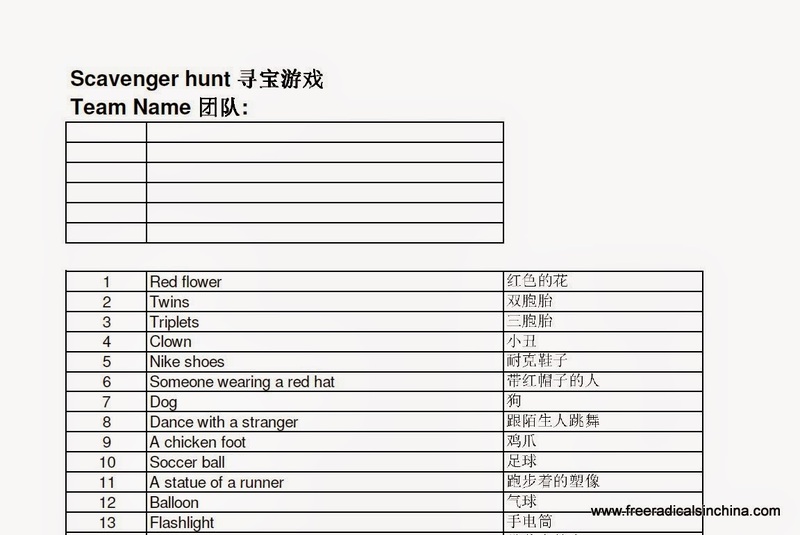 I texted my local friends (Chinese and foreign) to meet at Olympic Forest Park for a super fun game called 寻宝游戏 (treasure hunt). Nobody had ever heard of such a game and wondered what it could be. Ok, anticipation raised. Will I pull it off? What kind of treasures could we find at a Chinese public park? Chopsticks? Flowers? Dogs? 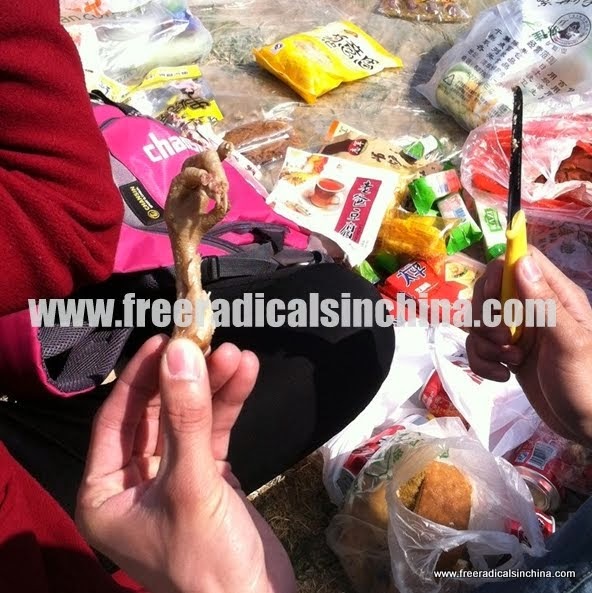 Chicken feet snack? I took some wild guesses and produced a list of 50 items for participants to find within a one hour time limit. Over thirty of us gathered at the park. We were from America, Australia, Italy, Japan, Korea, and of course, China. We spanned generations, ranging from 8 to 80 years old. Nine teams composed of three to four people raced around the park seeking the mundane (dogs and runners), the elusive (triplets), and doing the embarrassing (dancing and singing with strangers). I am happy to say the game was a hit! The teams came back excited, out of breath, and eager to share their results. The winning team found 38 out of 50 items, and I rewarded them with packages of gummy bears brought from the USA. They, of course, generously shared the sweets with everyone. Then we enjoyed the mild sunshine and mild temperatures while spooning (or chopsticking) food into one another's bowls. My Chinese aunties filled my bowl with home-made fried rice and fish, cucumber, and tea eggs. My Japanese bestie supplied sushi rolls (so deee-lish). Xialian kept us healthy with a healthy banana bread. I made an unhealthy apple cake loaded with sugar and coconut oil. The kids jabbered about how many bearded men they found (also on the list). My goal was for us to have fun. Mission accomplished. Wǒmen wán tè hǎo de yóuxì bǐsài! Jiùshì xúnbǎo yóuxì! English Translation: We play a special game! It’s a scavenger hunt! I am definitely at a potluck in China. Fried rice topped with dried spicy fish, cucumber, and tea egg. On February 9, we left Beijing's winter and 15 hours later descended into California's spring. The trees teemed with blossoms and the skies gleamed blue. Thirty days later, March 9, BirdMAN's mom and sister dropped us off with our bags full of Costco necessities (tortillas and semi-sweet chocolate chips) and we made our journey over the Pacific Ocean once again. Our California trip was good. We met some babies who came into the world while we were gone, and one that came while we were there. But it was sad too. Baba D's cancer had spread and treatment options were limited. The inevitable was no longer in the sometime future--it was imminent. While we had some good days together with the entire family, most of our trip revolved around Baba D and making him comfortable in his final days. I plan to write about the beauty and agony BirdMAN's family experienced during that time, but I'm not there yet emotionally. This blog is to share some of the nice photographs of all the beautiful kids that we got to catch up with --albeit briefly. Youth is beautiful. It just goes by so fast. 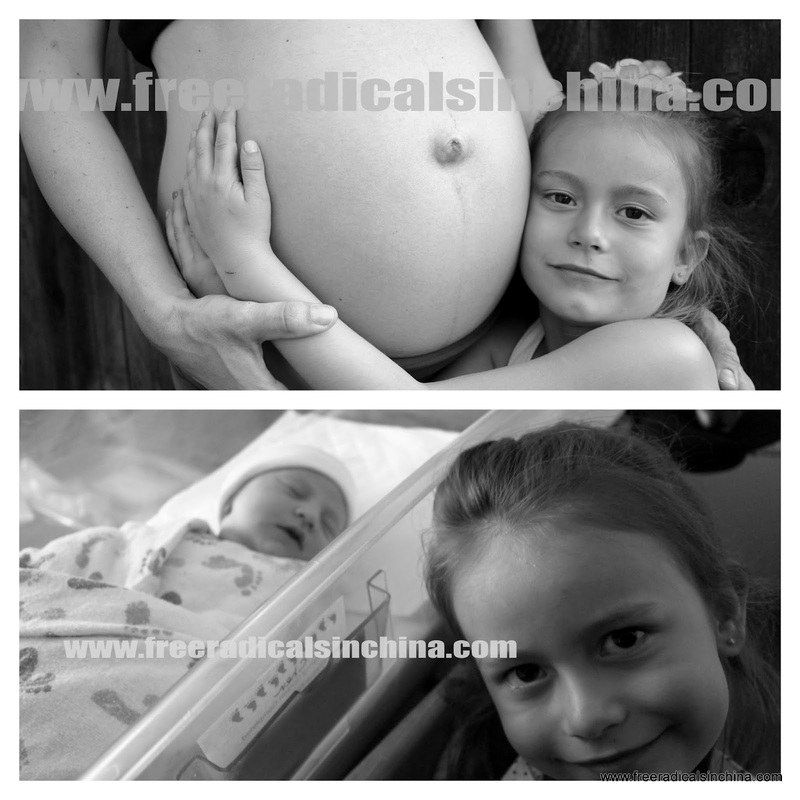 Milan was so happy to meet baby sister, Capri! So glad to meet Sabella! Here she is in Baba's lap. Along came Caleb. Good to make his acquaintance. Blanca and I teaching the next generation about Ussies. Zeph and I are so EXCITED about sandwiches! Zeph is one adventurous boy! Evening fishing with the boys. 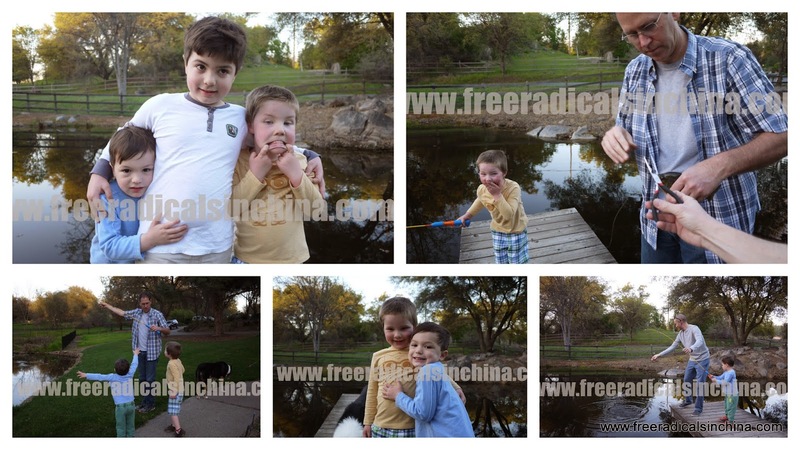 Elliot loved fishing but was a little scared of the fish. Good thing Uncle Mike doesn't mind getting his hands dirty. Good to get in some Dad time too. Big sister, Jasmine, made this chocolate cake out of beets and avocado. The kids were successfully tricked into eating their veggies! Milan is such a good helper! We can't wait to eat some Moomoo pancakes. Our clay dinos. Milan is quite the artist, isn't she? Uncle K is so much fun!